Wild: Thylacoleo furtimorsus is a large, powerful marsupial that can often be found hunting around trees. Its long claws and semi-opposable digits make it an apt climber, a quality that Thylacoleo uses to its advantage while hunting. It clambers up trees and waits to ambush passing prey by pouncing upon them. When something that large jumps onto a target, it becomes stunned and doesn't stand much chance. 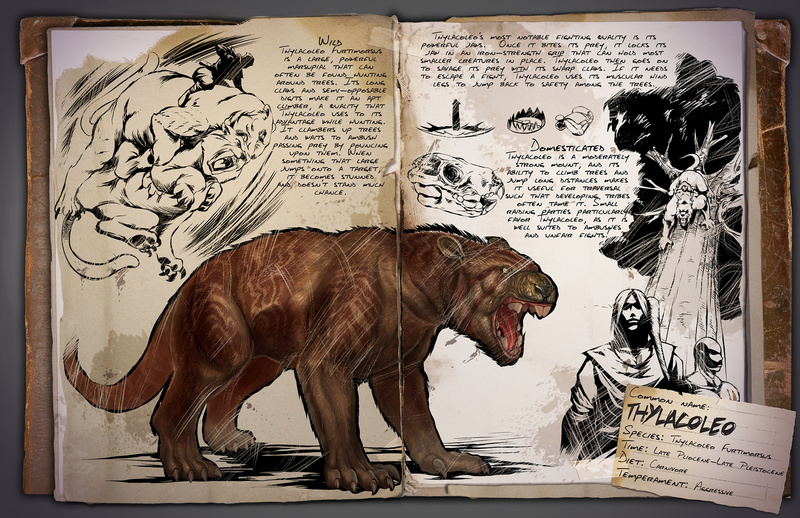 Known Information: Thylacoleo's most notable fighting quality is its powerful jaws. Once it bites its prey, it locks its jaw in an iron-strength grip that can hold most smaller creatures in place. Thylacoleo then goes on to savage its prey with its sharp claws. If it needs to escape a fight, Thylacoleo uses its muscular hind legs to jump back to safety among the trees.